Here is a UCSF lecture by a psychiatrist about how mindfulness meditation can help with depression and mental health. This is amazing. I thought psychiatrists only cared about dissing out drugs. I didn't know they cared about meditation. A guided meditation on dealing with depression. Meditation has long been touted as a holistic approach to pain relief. And studies show that long-time meditators can tolerate quite a bit of pain. Now researchers at Wake Forest Baptist Medical Center have found you don't have to be a lifelong Buddhist monk to pull it off. Novices were able to tame pain after just a few training sessions. Sounds a bit mystical, we know, but researchers using a special type of brain imaging were also able to see changes in the brain activity of newbies. Their conclusion? 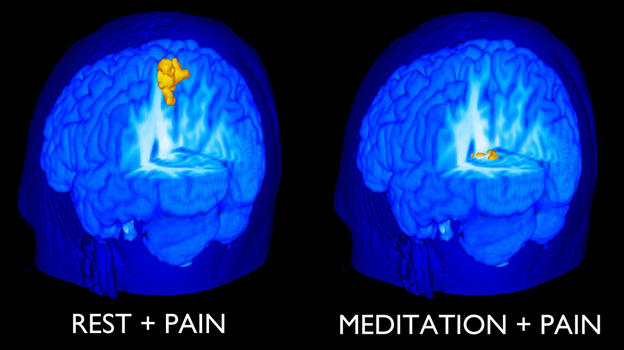 "A little over an hour of meditation training can dramatically reduce both the experience of pain and pain-related brain activation," Fadel Zeidan, a neuroscientist and the study's lead author, tells Shots. That finding's a first, Zeidan says. In the study, a small group of healthy medical students attended four 20-minute training sessions on "mindfulness meditation" â€” a technique adapted from a Tibetan Buddhist form of meditation called samatha. It's all about acknowledging and letting go of distraction. "You are trying to sustain attention in the present moment â€” everything is momentary so you don't need to react," Zeidan explains. "What that does healthwise is it reduces the stress response. The feeling of pain is a very blatant distraction." So how did the researchers gauge the effect? They administered a very distracting bit of pain: A small, thermal stimulator heated to 120 degrees was applied to the back of each volunteer's right calf. The subjects reported both the intensity and unpleasantness of the pain. If pain were music, intensity would be volume. Unpleasantness would have more of an emotional component, kind of like how much you love or hate a song. After meditation training, the subjects reported a 40 percent decrease in pain intensity and a 57 percent reduction in pain unpleasantness. And it wasn't just their perception of pain that changed. Brain activity changed too. This depiction of the body, the cortical homunculus, was first developed by Wilder Penfield. Each body part maps to a specific spot on a cross section of the brain's sensory processing region, the primary somatosensory cortex. The larger the feature, the more brain space devoted to it. Every part of the body is mapped to a specific part of the brain called the primary somatosensory cortex. "If I touch you on your left hand right above your left knuckle, there is an area in the brain that corresponds to that specific area in your hand that will be activated," Zeidan explains. "When you are in pain it is much more activated â€” more intense and more widespread." This activation shows up on MRI brain scans. When subjects experienced the heat stimulus under normal conditions, the "right calf" part of the primary somatosensory cortex lit up. But after the subjects were trained in meditation, the activity in this region was not even detectable. Brain images also show that meditation increased activation in areas of the brain related to cognitive control and emotion â€” areas where the experience of pain is built. What's more, better meditators (those who scored higher on a standard scale of mindfulness) tended to have more activation in these areas and a lower experience of pain. But can you achieve similar results by just approximating meditation, or believing you are in control of your pain tolerance? Zeidan says probably not. In this study, subjects who paid attention to their breathing to mimic meditation saw no significant change in pain. And, in a previous study, subjects given fake training failed to see meditation's effects, even though they believed they were actually performing mindfulness meditation. Zeidan says he will run some more studies to get at how meditation relieves pain. He hopes meditation can soon be applied clinically, perhaps to help patients cope with pain after surgery or chemotherapy. "You might not need extensive training to realize pain-relief benefits," Zeidan says. "Most people don't have time to spend months in a monastery." Meditation is an ideal exercise for the mental health. It's recommended for the mental relaxation and to deal with the different mental illnesses. It plays an important role to deal with the stress, depression, and anxiety. They used a very annoying bit of pain: A little, heat activator warmed to 120 levels was used to the back of each volunteer's right leg. The topics revealed both the strength and unpleasantness of the discomfort. If discomfort were songs, strength would be quantity. Unpleasantness would have more of an psychological element, type of like how much you really like or dislike a songs. The meditation teacher I first learned meditation from specialized in teaching pain control. 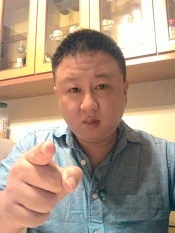 He would teach techniques to HIV patients. At that time, he also got into American spirituality and actually participated in a Sun Dance. At the end of a Sun Dance they hang you from a tree by two knives in your breasts until the knives cut through your skin and you fall to earth. He meditated in a monastery in Japan for about 10 years so has obviously developed a high capability to eliminate pain. Here is a talk on his techniques.